Cinema Kabuki Coming to L.A.
You are at:Home»English»Life & Arts»Film & TV»Cinema Kabuki Coming to L.A.
Kabuki theater, with origins dating back to the 1600s, has remained steeped in tradition while constantly innovating. Live productions, featuring some of today’s greatest kabuki stars, are now being filmed with the highest-resolution cameras for screening in theaters around the world on state-of-the-art digital projection systems. Since 2005, Kabuki production company Shochiku Co. Ltd. has released Cinema Kabuki, which offers English speakers the unique opportunity to experience full-scale kabuki performances by some of Japan’s biggest stars in high definition on the big screen with English subtitles. This, however, is no regular film screening; Cinema Kabuki allows the audience to vividly experience the excitement of the live stage through the full use and wide-range capability of high-definition (HD) images and six-channel sound. 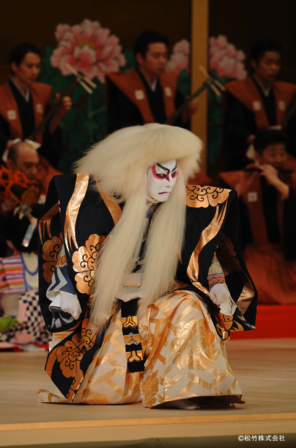 Enjoy the authenticity of kabuki as if you were sitting in the best seat of the Metropolitan Opera House. “Lion Dance” (Kagamijishi) on Saturday, Feb. 6, at 7:30 p.m. at the Aratani Theatre, 244 S. San Pedro St. in Little Tokyo. Admission free. No reservation required. Seats available on a first-come, first-served basis. “The Haunted Sword” (Kagotsurube) on Thursday, Feb. 11, at 7:30 p.m. at the Billy Wilder Theater in Hammer Museum, 10899 Wilshire Blvd., Los Angeles. Followed by after-party in courtyard. Admission free. For ticketing information, click here. Presented by Japan Foundation Los Angeles, (323) 761-7510, www.jflalc.org. Co-presented by Shochiku, Consulate General of Japan in Los Angeles, Japanese American Cultural and Community Center, Hammer Museum, and Japan Business Association of Southern California.